V. E. Schmidt and Rzhanov, Y., “Measurement of Micro-bathymetry with a GOPRO Underwater Stereo Camera Pair”, IEEE Oceans. IEEE, Hampton Roads, VA, 2012. Y. Rzhanov, “Methodology of Processing of Stereoimagery of Fish Underwater: Software and Algorithms”, Center for Coastal and Ocean Mapping / Joint Hydrographic Center, Durham, NH, 2012. R. Wigley and Compton, J., “Microstratigraphy of a Miocene layered phosphatic pebble from the western margin of South Africa”, Sedimentology, vol. 59. p. (early view online version only), 2012. A. Trembanis, Cary, C., Schmidt, V. E., Clarke, D., Crees, T., and Jackson, E., “Modular Autonomous Biosampler (MAB)- A prototype system for distinct biological size-class sampling and preservation”, IEEE Oceans. IEEE, Hampton Roads, VA, 2012. T. Butkiewicz, “A More Flexible Approach to Utilizing Depth Cameras for Hand & Touch Interaction”, IEEE VR 2012, Workshop on Off-the-Shelf Virtual Reality, vol. to appear in The International Journal of Virtual Reality. IEEE, Orange County, CA, USA, 2012. S. Clarke, Hubble, T., Airey, D., Yu, P., Boyd, R., Keene, J., Exon, N., and Gardner, J. V., “Morphologic characteristics and tsunamogenic potential of southeastern Australia’s upper continental slope submarine landslides.”, 6th International symposium on submarine mass movements and their consequences. Kiel, Germany, 2012. J. L. Pirtle, Ibarra, S. N., and Eckert, G. L., “Nearshore subtidal community structure compared between inner coast and outer coast sites in Southeast Alaska”, Polar Biology, vol. 35. pp. 1889-1910, 2012. J. Beaudoin, “New Developments in Backscatter”, NOAA Field Procedures Workshop. p. Newport, OR, 2012. A. Skarke, Lobecker, E., Malik, M. A., and VerPlanck, N., “NOAA Ship Okeanos Explorer 2012 Field Season in the Northern Gulf of Mexico and U.S. Continental Margin”, 2012 Fall Meeting, American Geophysical Union (AGU). San Francisco, CA, United States, 2012. A. L. Forrest, Hamilton, A. K., Schmidt, V. E., Laval, B. E., Mueller, D., Crawford, A. J., Brucker, S., and Gagnon, J., “Observations beneath the grounded Petermann Ice Island–B (PII–B) in the Canadian Arctic”, ASM2012. Vancouver, British Columbia, Canada, 2012. L. McKenna, Lippmann, T. C., and Gallagher, E. L., “Observations of Bedform Evolution in an Inlet”, Ocean Sciences. Salt Lake City, UT, United States, 2012. L. McKenna, Lippmann, T. C., and Gallagher, E. L., “Observations of Bedform Evolution in an Inlet”, TOS/ASLO/AGU Ocean Sciences. Salt Lake City, UT, 2012. T. C. Lippmann, Irish, J. D., McKenna, L., and Foster, D., “Observations of Currents in a Tidally Modulated Inlet”, TOS/ASLO/AGU Ocean Sciences. Salt Lake City, UT, 2012. C. Fandel, Lippmann, T. C., Irish, J. D., and Foster, D., “Observations of Pockmark Flow Structure in Belfast Bay, Maine”, 2012 Ocean Science Meeting. Salt Lake City, UT, 2012. B. Reser, “OS51D-1907. The Evolution of Information Management in Oceanographic Exploration”, 2012 Fall Meeting, American Geophysical Union (AGU). 2012. T. M. Shank, “OS51D-1912. Exploration and Discovery of Hydrocarbon Seeps, Coral Ecosystems, and Shipwrecks in the Deep Gulf of Mexico”, 2012 Fall Meeting, American Geophysical Union (AGU). 2012. E. Lobecker, “OS51E-1925. Integration of NOAA Ship Okeanos Explorer Seafloor Mapping, Little Hercules ROV, and Sentry AUV Data into Ocean Exploration Operations and Public Data Holdings”, 2012 Fall Meeting, American Geophysical Union (AGU). 2012. L. G. Ward, Irish, J. D., and Knuuti, K., “Physical processes and morphologic changes in Hampton-Seabrook Harbor, New Hampshire: Natural and anthropogenic alterations”, Northeast Section, Geological Society of America Annual Meeting. Bretton Woods, NH, 2012. T. Hubble, Yu, P., Airey, D., Clarke, S., Boyd, R., Keene, J., Exon, N., and Gardner, J. V., “Physical Properties and Age of Continental Slope Sediments Dredged from the East Australian Continental Margin - Implications for Timing of Slope Failure”, 11th International Symposium on Landslides. Banff, Alberta, Canada, 2012. L. Alexander and Casey, M. J., “Portable Piloting Unit (PPU) Replacement Study: Phase 2”, Laurentian Pilotage Authority, Montreal, Quebec, Canada, 2012. L. Alexander and Fukuto, J., “Portraying e-Navigation Information: Challenges and Opportunities”, e-Navigation Underway 2012. Copenhagen, Denmark, 2012. Y. Rzhanov and Pe'eri, S., “Pushbroom-frame Imagery Co-registration: USACE's CHARTS”, Marine Geodesy, vol. 35. pp. 141-157, 2012. R. Ranasinghe, Holman, R., de Schipper, M., Lippmann, T., Wehof, J., T. Duong, M., Roelvink, D., and Stive, M., “Quantifying Nearshore Morphological Recovery Time Scales Using ARGUS Video Imaging: Palm Beach, Sydney and Duck, NC”, 33rd International Conference on Coastal Engineering, vol. 24. ASCE, Santander, Spain, pp. 1-7, 2012. A. L. Forrest, Wittmann, M. E., Schmidt, V. E., Raineault, N. A., Hamilton, A. K., Pike, W., Schladow, S. G., Reuter, J. E., Laval, B. E., and Trembanis, A., “Quantitative assessment of invasive species in lacustrine environments through benthic imagery analysis”, Limnology and Oceanography: Methods. 2012. Y. Rzhanov, “Review of Methods and Software for Processing of Underwater Imagery and Construction of Mosaics”, Center for Coastal and Ocean Mapping / Joint Hydrographic Center, Durham, NH, 2012. J. Beaudoin and Johnson, P., “R/V Kilo Moana Multibeam Echosounder System Review”, Center for Coastal and Ocean Mapping / Joint Hydrographic Center, Durham, NH, USA, 2012. J. Beaudoin, Floc'h, H., and Lurton, X., “SAT and Trial Cruise of the Acoustical Sensors Onboard R/V Falkor”, Center for Coastal and Ocean Mapping / Joint Hydrographic Center & Ifremer, 2012. S. Pe'eri, Karlsson, T., Axelsson, A., Rzhanov, Y., and Riley, J., “The Sea State Condition as an Environmental Factor in Airborne Lidar Bathymetry (ALB)”, 13th Annual Coastal Mapping & Charting Workshop of the Joint Airborne Lidar Bathymetry Technical Center of Expertise (JALBTCX). USACE JALBTCX, Chicago, IL, USA, 2012. J. L. Pirtle, Weber, T. C., Wilson, C. D., and Rooper, C., “Seafloor Characterization for Trawlability and Fish Habitat Using the Simrad ME70 Multibeam Echosounder in the Gulf of Alaska”, 2nd National Habitat Assessment Workshop: Fisheries Science to Support NOAA’s Habitat Blueprint. NOAA Fisheries Office of Science and Technology, Seattle, WA, USA, 2012. J. L. Pirtle, Weber, T. C., Wilson, C. D., and Rooper, C., “Seafloor Characterization for Trawlability and Fish Habitat Using the Simrad ME70 Multibeam Echosounder in the Gulf of Alaska”, Ocean Sciences Meeting - ASLO/AGU/TOS. Salt Lake City, UT, United States, 2012. A. Morris, Pe'eri, S., Clyde, W. C., and Ackerman, S., “Seafloor Characterization of the Merrimack River Ebb Tidal Delta”, GSA 47th Annual Meeting - Northeastern Section. Hartford, CT, 2012. C. E. Parrish, “Shoreline Mapping”, in Advances in Mapping from Remote Sensor Imagery: Techniques and Applications, Boca Raton, Florida: CRC Press, Taylor and Francis Group, 2012. J. Beaudoin, “Sound Speed Corrections for Trackline Surveys”, NOAA Field Procedures Workshop. p. Newport, OR, 2012. S. Clarke, Hubble, T., Airey, D., Yu, P., Boyd, R., Keene, J., Exon, N., and Gardner, J. V., “Submarine Landslides on the Upper Southeast Australian Passive Continental Margin – Preliminary Findings”, 11th International Symposium on Landslides. Banff, Alberta, Canada, 2012. S. Clarke, Hubble, T., Airey, D., Yu, P., Boyd, R., Keene, J., Exon, N., and Gardner, J. V., “Submarine landslides on the upper southeast Australian passive continental margin – preliminary findings”, 6th International symposium on submarine mass movements and their consequences. Kiel, Germany, 2012. A. R. Norton, “Submerged aquatic vegetation and bedforms in eastern Cape Cod Bay: Spatial distributions, attributes and associations”, University of Delaware, Newark, DE, 2012. C. Ware, “Target Finding with a Spatially Aware Hand-Held Chart Display”, Human Factors, vol. On-line pre publication. 2012. C. Russel, Pinner, W., Lovalvo, D., Skarke, A., Lobecker, E., Malik, M. A., and Nadeau, L. T. M., “Technology: NOAA Ship Okeanos Explorer”, Oceanography , vol. 25. pp. 12-15, 2012. M. L. Wolfson-Schwehr, Boettcher, M. S., and Behn, M. D., “Thermal Constraints on the Rheology of Segmented Oceanic Transform Fault Systems”, 2012 Fall Meeting, American Geophysical Union (AGU). San Francisco, CA, United States, 2012. C. E. Parrish, White, S. A., Aslaksen, M., Pfennigbauer, M., and Rieger, P., “Topographic-Bathymetric LIDAR Evaluation for Integrated Ocean and Coastal Mapping”, European LiDAR Mapping Forum (ELMF). Salzburg, Austria, 2012. L. Alexander, USACE Inland ENC Manual, 1stst ed. Fort Belvior, Alexandria, VA: U.S. Army Corps of Engineers - Army Geo-spatial Center, 2012, p. 52. A. Šaškov, Dahlgren, Thomas, Schläppy, M. - L., and Rzhanov, Y., “Usage of Videomosaic for Computer Aided Analysis of North Sea Hard Bottom Underwater Video for Baseline Study of Offshore Windmill Park”, Climate Change Research, Ocean Observations & Advanced Technologies for Regional Sustainability. Klaipeda, Lithuania, 2012. B. M. Sullivan, “Using a Cruise Report to Generate XML Metadata”, IEEE/MTS Oceans. IEEE/MTS, Hampton Roads, VA, 2012. J. Beaudoin, “USNS Mary Sears EM122 Multibeam Echosounder Sea Acceptance Trials”, Center for Coastal and Ocean Mapping / Joint Hydrographic Center, Durham, NH, USA, 2012. D. Monahan, “Where are the bathymetric hot spots?”, Bathymetric Science . GEBCO , Monaco, 2012. W. Uddin, Gutelius, B., and Parrish, C. E., “Airborne Laser Survey Specifications and Quality Management Protocols for Airport Obstruction Surveys”, Transportation Research Record, vol. 2214. International Hydrographic Bureau, Monaco, Monaco Cedex, Monaco, pp. 117-125, 2011. A. Skarke and Trembanis, A., “Parameterization of bedform morphology and defect density with fingerprint analysis techniques”, Continental Shelf Research, vol. 31. Elsevier, New York, NY, USA, pp. 1688-1700, 2011. S. Pe'eri, Morgan, L. V., Philpot, W. D., and Armstrong, A. A., “Shoreline mapping resolved from airborne LIDAR bathymetry (ALB) waveforms.”, Journal of Coastal Research, Special Issue: Applied LIDAR Techniques, vol. 62. Coastal Education & Research Foundation, Inc. [CERF], West Palm Beach, FL, USA, pp. 75-85, 2011. T. Adams, Beets, P., and Parrish, C. E., “Another dimension from LiDAR – Obtaining foliage density from full waveform data ”, SilviLaser. Hobart, Tasmania, Australia, 2011. C. E. Parrish, Jeong, I., Nowak, R. D., and Smith, R. B., “Empirical Comparison of Full-Waveform Lidar Algorithms: Range Extraction and Discrimination Performance”, Photogrammetric Engineering and Remote Sensing, vol. 77. ASPRS: The Imaging and Geospatial Information Society, Bethesda, MD, USA, pp. 825-838, 2011. C. E. Parrish and Osiri, R., “Lidar Wavelength Considerations and Radiometric Performance Analysis for Coastal Applications (Invited)”, American Geophysical Union (AGU) Fall Meeting. San Francisco, CA, USA, 2011. J. V. Gardner and Armstrong, A. 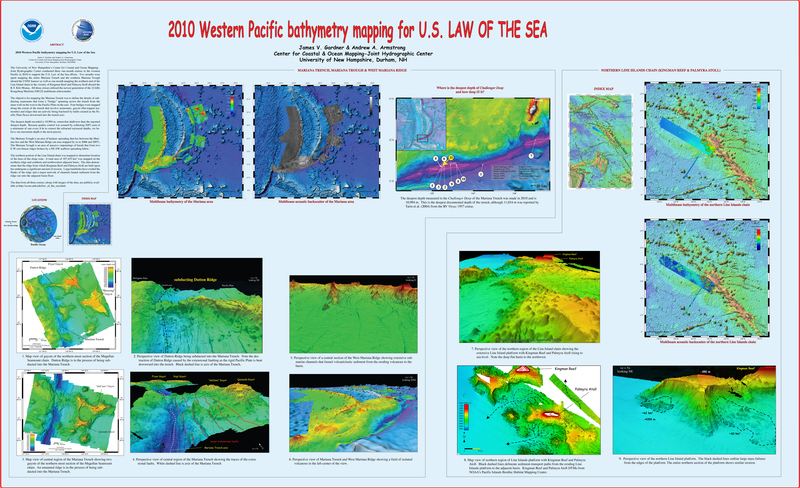 A., “2010 Western Pacific bathymetry mapping for U.S. Law of the Sea”, U.S. Hydrographic Conference (US HYDRO). Tampa, FL, USA, 2011. J. A. Alvarado, “Acoustic Backscatter Processing for the Navy of Ecuador”. 2011. T. C. Lippmann, “Africa Partnership Station”, Office of Naval Reasearch (ONR) , Durham, NH, USA, 2011. Y. Rzhanov, Pe'eri, S., and Gardner, J. V., “Airborne hyperspectral co-registration independent from attitude and positioning sensors”, Coastal GeoTools 2011. Myrtle Beach, SC, USA, 2011. M. L. Schroth-Miller and Weber, T. C., “Assessing juvenile Atlantic bluefin tuna schools in the Northwest Atlantic using sonar data and aerial imagery”, 161st meeting of the Acoustical Society of America. Seattle, WA, USA, 2011. D. T. Jones, Weber, T. C., Rooper, C., Butler, J. L., Wilson, C., and De Robertis, A., “Assessing rockfish abundance in complex habitats using acoustics and cameras”, 161st meeting of the Acoustical Society of America. Seattle, WA, USA, 2011. C. Monfort and Lippmann, T. C., “Assimilation of airborne imagery with a wave model for bathymetric estimation.”, Journal of Coastal Research, Special Issue: Applied LIDAR Techniques, vol. 62. Coastal Education & Research Foundation, Inc. [CERF], West Palm Beach, FL, USA, pp. 40-49, 2011. S. Pe'eri, Guilford, J., Lundgren, I., and Battista, T., “Buck Island, St. Croix - Seafloor characterization using optic remote sensing”, 12th Annual JALBTCX Airborne Coastal Mapping & Charting Technical Workshop. Baltimore, MD, USA, 2011. T. Beduhn, “A Case Study of Robust Bottom Detection and Eelgrass Mapping in Great Bay, New Hampshire”. 2011. T. C. Weber, Lyons, A. P., and Bradley, D. L., “Consistency in statistical moments as a test for bubble cloud clustering”, Journal of the Acoustical Society of America, vol. 130. pp. p. 3,396 - 3,405, 2011. G. Masetti, Trucco, A., and Sacile, R., “Correzioni geometriche e radiometriche applicabili a valori di backscatter raccolti con sistemi MBES Kongsberg EM 3002”, 15th CONFERENZA NAZIONALE ASITA 2011. Reggia di Colorno, ITA, 2011. C. Ware and Pineo, D., “Data visualization optimization via a computational model of human perception”, ACM Transactions on Visualization and Computer Graphics., vol. 17. pp. p. 292 - 300, 2011. J. Beaudoin, Sade, A., Schulze, B., and Hall, J. K., “Dead Sea Multi-beam Echo Sounder Survey”, Hydro International, vol. 15. pp. 21-23, 2011. G. A. Rice, Weber, T. C., Beaudoin, J., and Pirtle, J. L., “Descriptive Report for Project BY1001”, NOAA Integrated Ocean and Coastal Mapping Center, Durham, NH, USA, 2011. Y. Rzhanov, Cutter Jr., R. G., Matal, Y., and Kastner, R., “Detection, measurement and recognition of fish species underwater”, Mesh Atlantic Video Survey Techniques Workshop. Faro, Algarve, POR, 2011. T. C. Lippmann, Rzhanov, Y., and Pe'eri, S., “Digital Airborne Vide System for Unbiased Image Matching with Shallow Water Applicationsv”, 12th Annual JALBTCX Airborne Coastal Mapping and Charting Workshop . Baltimore, MD, USA, 2011. H. Hecht, Berking, B., Jonas, M., and Alexander, L., The Electronic Chart. Fundamentals, Functions and other Essentials: A Textbook for ECDIS Use and Training, Third. Lemmer, The Netherlands: Geomares Publishing, 2011, p. 378. V. E. Schmidt, “Empirical Uncertainty Estimation for the Klein 5000v2 Sonar”, Center for Coastal and Ocean Mapping / Joint Hydrographic Center, Durham, NH, USA, 2011. L. Alexander, “e-Navigation and Pilotage: Challenges and Opportunities”, 2011 Canadian Maritime Pilots Association Congress. Halifax, Nova Scotia, Canada, 2011. M. L. Schroth-Miller and Weber, T. C., “Estimating Atlantic Bluefin Tuna number density using the second moment of intensity”, Acoustical Society of America. San Diego, CA, USA, 2011. D. Monahan, “Evaluation of Servicio Hidrográfico y Oceanográfico de la Armada de Chile (SHOA ) Capability in Non-navigational Ocean Mapping ”, GEBCO, Valparaiso, CHL, 2011. S. Ackerman, Pe'eri, S., Bernhardt, W., Andrews, B., and Gardner, J. V., “Fine-scale sediment distribution at the mouth of the Merrimack River”, Coastal Geotools 2011. Myrtle Beach, SC, USA, 2011. J. V. Gardner and Armstrong, A. A., “From Seafloor Mapping to Geological Processes: New Insights in Marine Geomorphic Features Using High-Resolution Acoustic Imaging Techniques”, American Geophysical Union (AGU). San Francisco, CA, USA, 2011. S. Pe'eri, Ackerman, S., Guilford, J., Gardner, J. V., and Morris, A., “Ground truth operation for seafloor characterization”, Coastal Geotools 2011. Myrtle Beach, SC, USA, 2011. T. Beduhn and Dijkstra, S. J., “On the Horizon: Better Bottom Detection for Areas of Sub-Aquatic Vegetation”, U.S. Hydrographic Conference (US HYDRO). Tampa, FL, USA, 2011. G. Masetti and Orsini, F., “I relitti delle navi da guerra: status e tutela giuridica”, Informazioni delle Difesa, vol. 5. Ministero Della Difesa, Rome, Italy, pp. 24-31, 2011. L. Alexander, “IALA’s Vision of e-Navigation”, 2011 Canadian Maritime Pilots Association Congress. Halifax, Nova Scotia, Canada, 2011. R. Ward and Alexander, L., “The IHO’s Involvement in e-Navigation”, IALA Bulletin, vol. 2011, No. 1. pp. 26-27, 2011. S. J. Dijkstra and Armstrong, A. A., “IHO/FIG/ICA Category A Course Program Submission”, Center for Coastal and Ocean Mapping/ Joint Hydrographic Center, Durham, NH, USA, 2011. M. Wilson, Miller, J. J., Self Miller, V., Mortimer, K., and Wyllie, K., “Improved Raster Navigation Products From High Resolution Source Data”, U.S. Hydrographic Conference (US HYDRO). Tampa, FL, USA, 2011. R. Wigley and Monahan, D., “The Indian Ocean Bathymetric Mapping Project”. 2011. T. C. Lippmann, “Large Scale Observation of Fine-scale Seabed Morphology and Flow Structure in Tidally Modulate Inlets”, Office of Naval Reasearch (ONR) , Durham, NH, USA, 2011. S. Pe'eri and Long, B., “Lidar Technology Applied in Coastal Studies and Management”, Journal of Coastal Research, vol. S162. pp. p. 1-5, 2011. A. R. Norton, Brown, M., Trembanis, A., and Borrelli, M., “Mapping and quantifying morphological parameters of eelgrass (Zostera marina) beds in eastern Cape Cod Bay, MA using an interferometric sonar system”, Coastal and Estuarine Research Federation Meeting, Daytona Beach, FL. 2011. J. V. Gardner and Armstrong, A. A., “The Mariana Trench: A New View Based on Multibeam Echosounding”, American Geophysical Union, Fall Meeting. San Francisco, CA, United States, 2011. G. A. Rice and Riley, J., “Measuring the Water Level Datum Relative to the Ellipsoid During Hydrographic Survey”, U.S. Hydrographic Conference (US HYDRO). Tampa, FL, USA, 2011. C. Lanzoni and Weber, T. C., “A Method for Field Calibration of a Multibeam Echo Sounder”, Oceans MTS/IEEE 2011. Kona, HI, USA, 2011. T. C. Weber, Schroth-Miller, M. L., Lutcavage, M. E., Pe'eri, S., and Rzhanov, Y., “Mid-frequency backscatter from spatially organized fish schools”, 162nd meeting of the Acoustical Society of America. San Diego, CA, USA, 2011. J. D. Kessler, Valentine, D., Redmond, M., Du, M., Chan, E., Mendes, S., Quiroz, E., Villanueva, C., Shusta, S., Werra, L., Yvon-Lewis, S., and Weber, T. C., “A persistent oxygen anomaly reveals the fate of spilled methane in the deep Gulf of Mexico”, Science, vol. 331. pp. p. 312 - 315, 2011. C. Canning, Crain, D., Eaton, J. T. S., Nuesslya, K., Friedlaender, A. S., Hurst, T., Parks, S., Ware, C., Wiley, D. N., and Weinrich, M. T., “Population-Level Lateralized Feeding Behaviour in North Atlantic Humpback Whales (Megaptera novaeangliae), ”, Animal Behavior, vol. 82. pp. p. 901 - 909, 2011. L. Alexander, “Providing Meteorological and Hydrographic Information via AIS Application-Specific Messages: Challenges and Opportunities”, 2011 US Hydrographic Conference. Tampa, FL, USA, 2011. N. A. Kuenzel, “Quantitative Morphological Analysis of Submarine Canyon-channel Systems on the U.S. Atlantic Continental Margin”, University of New Hampshire, Durham, NH, 2011. R. Osiri, “Radiometric Calibration and Evaluation of Lidar Data for Coastal Science Applications”. 2011. G. Masetti, Sacile, R., and Trucco, A., “Remote characterization of seafloor adjacent to shipwrecks using mosaicking and analysis of backscatter response”, Italian Journal of Remote Sensing, vol. 43. Italian Society of Remote Sensing, pp. 77-92, 2011. J. Eisenberg, Brodet, S., and Beaudoin, J., “Rethinking the Patch Test for Phase Measuring Bathymetric Sonars”, US Hydrographic Conference 2011. Tampa Bay, FL, USA, 2011. S. Pe'eri, Gardner, J. V., Ward, L. G., and Morrison, J. R., “The Seafloor: A Key Factor in Lidar Bottom Detection”, IEEE Transactions on Geoscience and Remote Sensing, vol. 49. IEEE, Washington DC, Washington DC, USA, pp. 1150-1157, 2011. Y. Rzhanov, Pe'eri, S., Guilford, J., and Gardner, J. V., “Seafloor characterization using airborne hyperspectral co-registration procedures independent from attitude and positioning sensors”, Coastal Geotools 2011. Myrtle Beach, SC, USA, 2011. J. Beaudoin, Smyth, S., Furlong, A., Floc'h, H., and Lurton, X., “Streamlining Sound Speed Profile Pre-Processing: Case Studies and Field Trials”, U.S. Hydrographic Conference (US HYDRO). Tampa, FL, USA, 2011. W. Burns, Johnson, G., Gonin, I., and Alexander, L., “Testing of AIS Application-Specific Messages to Improve US Coast Guard VTS Operations”, e-Navigation Underway Conference. Copenhagen, Denmark, 2011. D. N. Wiley, Ware, C., Bocconcelli,, Cholewaik, D., Friedlaender, A. S., Thompson, M. A., and Weinrich, M. T., “Underwater Components of Humpback Whale Bubble-net Feeding”, Behavior, vol. 148. pp. p. 575 - 602, 2011. A. A. Armstrong, “U.S. Extended Continental Shelf Cruise to Map Sections of the Mariana Trench and the Eastern and Southern Insular Margins of Guam and the Northern Mariana Islands”, Center for Coastal and Ocean Mapping / Joint Hydrographic Center, 2011. C. Ware, Friedlaender, A. S., Tyson, R. B., and Nowacek, D. P., “Using multi-sensor suction cup tags to quantify the kinematics of lunge feeding in humpback whales (Megaptera novaeangliae) in the water around the West Antarctic Peninsula. ”, Biologging. Hobart, Tasmania, Australia, 2011. J. V. Gardner and Armstrong, A. A., “Western Pacific bathymetry mapping for U.S. Law of the Sea”, U.S. Hydro 2011. Tampa, FL, USA, 2011. L. Alexander and Bergmann, M., “Maritime Information Systems as a Component of e-Navigation”, International Association of Aids to Navigation and Lighthouse Authorities (IALA-AISM). Cape Town, Western Cape, South Africa, 2010. J. Daniell, Ujihara, N., Mahabier, B. G., Herwindya, A. Y., Freire, F. F., Zarayskaya, Y., Schwehr, K., Monahan, D., and Sharma, S., “A Marine GIS for the Oceania Region (MARGO); An Exploratory Project”, GEBCO Bathymetric Sciences Day. Lima, Peru, Peru, 2010. C. M. Bachmann, Montes, M. J., Fusina, R. A., Parrish, C. E., Sellars, J., Weidemann, A., Goode, W., Nichols, C. R., Woodward, P., McIlhany, K., Hill, V., Zimmerman, R., Korwan, D., Truitt, B., and Schwarzschild, A., “Bathymetry Retrieval from Hyperspectral Imagery in the Very Shallow Water Limit: a Case Study from the 2007 Virginia Coast Reserve (VCR’07) Multi-Sensor Campaign”, Marine Geodesy, vol. 33. Taylor & Francis, pp. 53-75, 2010. H. Hecht, Berking, B., Jonas, M., and Alexander, L., The Electronic Chart: Functions, Potential and Limitations of a New Navigation System, 3rd ed., no. Adam Kerr. Lemmers, Amsterdam, The Netherlands: GeoMares Publishing, 2010, pp. 1-441. M. Doucet, Paton, M., Gardner, J. V., and Greinert, J., “4D Multimodal Visualization and Analysis of Seafloor Vents and Plumes”, Canadian Hydrographic Conference (CHC). Quebec City, Quebec, Canada, pp. 1-2, 2010. M. L. Wolfson-Schwehr and Boettcher, M. S., “A Global Characterization of Physical Segmentation along Oceanic Transform Faults”, Southern California Earthquake Center. Palm Springs, CA, USA, pp. 293-293, 2010. L. Alexander, “Canadian e-Navigation User Needs Survey: Report on Comprehensive Results”, Canadian Coast Guard, 2010. T. K. Stanton, Chu, D., Jech, J. M., and Irish, J. D., “New Broadband Methods for Resonance Classification and High-resolution Imagery of Fish with Swimbladders using a Modified Commercial Broadband Echosounder”, ICES Journal of Marine Science, vol. 67. Elsevier, New York, NY, USA, pp. 365-378, 2010. T. Hamilton and Beaudoin, J., “Modeling the Effect of Oceanic Internal Waves on the Accuracy of Multibeam Echosounders”, Canadian Hydrographic Conference (CHC). Quebec City, Quebec, Canada, 2010. E. Lobecker, Malik, M. A., Johnson, J., and Boettcher, M. S., “EM302 Multibeam Survey of the Sangihe-Talaud Region, North Sulawesi, Indonesia”, American Geophysical Union (AGU). San Francisco, CA, USA, 2010. C. M. Bachmann, Nichols, C. R., Montes, M. J., Li, R., Woodward, P., Fusina, R. A., Chen, W., Mishra, V., Kim, W., Monty, J., McIlhany, K., Kessler, K., Korwan, D., Millar, W. D., Bennert, E., Smith, G. M., Gillis, D., Sellars, J., Parrish, C. E., Schwarzschild, A., and Truitt, B., “Retrieval of Substrate Bearing Strength from Hyperspectral Imagery during the Virginia Coast Reserve (VCR'07) Multi-Sensor Campaign”, Marine Geodesy, vol. 33. Taylor & Francis, pp. 101-116, 2010. L. Alexander, Schwehr, K., and Zetterberg, R., “Establishing a Regional AIS Application Specific Message Register”, International Association of Aids to Navigation and Lighthouse Authorities (IALA-AISM). Cape Town, Western Cape, South Africa, 2010. C. E. Parrish, White, S. A., and Aslaksen, M., “New Developments in Lidar Shoreline Mapping and Full-Waveform Lidar at NOAA”, European Lidar Mapping Forum (ELMF). The Hague, South Holland, The Netherlands, 2010. T. C. Weber, Williams, K., and Tang, D., “Acoustic Estimates of Size Distribution for Bubbles Released from the Seabed”, Acoustical Society of America (ASA). Cancun, Quintana Roo, Mexico, 2010. R. Boyd, Keene, J., Hubble, T., Gardner, J. V., Glenn, K., Ruming, K., and Exon, N., “Southeast Australia: A Cenozoic Continental Margin Dominated by Mass Transport”, in Submarine Mass Movements and Their Consequences, vol. 28, no. Mosher, Shipp, Moscardelli, Chaytor, Baxtor, Lee & Urgeles, New York, NY, USA: Springer Science, 2010, pp. 491-502. G. Masetti and Orsini, F., La Missione Atalanta e la politica estera dell’Unione Europea. Rome, Rome, Italy: Aracne Editrice, 2010. J. D. Irish, Vandemark, D., Shellito, S., Salisbury, J., Plagge, A., Hanley, K., and Emond, M., “CO2 Gas Exchange and Ocean Acidification Studies in the Coastal Gulf of Maine”, IEEE Oceans. Seattle, WA, USA, 2010. T. C. Lippmann and Rzhanov, Y., “Image Matching for Stabilizing Airborne Imagery with Shallow Water Applications”, Ocean Sciences Meeting, vol. 8. Portland, OR, USA, 2010. C. Monfort and Lippmann, T. C., “Assimilation of Airborne Imagery with a Wave Model for Bathymetric Estimation”, Journal of Coastal Research. Coastal Education & Research Foundation, Inc. [CERF], West Palm Beach, FL, USA, pp. 1-28, 2010. D. Pineo and Ware, C., “Neural Modeling of Flow Rendering Effectiveness”, ACM Transactions on Applied Perception (TAP), vol. 7. Association for Computing Machinery (ACM), New York, NY, USA, pp. 1-15, 2010. R. A. Fusina, Fry, J. C., Nichols, C. R., Bachmann, C. M., Li, R., Sellars, J., Parrish, C. E., Montes, M. J., Gross, C., White, S. A., Lee, K., and Jones, C. A., “Geodatabase Development to Support Hyperspectral Imagery Exploitation”, IEEE International Geoscience and Remote Sensing Symposium (IGARSS). Honolulu, HI, USA, 2010. G. Wiafe, Ababio, S. D., Addo, A., Agyekum, K., Ashton, A., Hapke, C., Lippmann, T. C., Roelvink, D., and Vogel, A., “Progress in Coastal Processes Research in Ghana”, Ocean Sciences Meeting. Portland, OR, USA, pp. 1-1, 2010. D. A. Butterfield, Holden, J. F., Shank, T. M., Tunnicliffe, V., Sherrin, J., Herrera, S., Baker, E. T., Lovalvo, D., Makarim, S., Malik, M. A., Wirasantosa, S., and Hammond, S., “Video Observations by Telepresence Reveal Two Types of Hydrothermal Venting on Kawio Barat Seamount”, American Geophysical Union (AGU). San Francisco, CA, USA, 2010. L. Alexander and Schwehr, K., “Establishing an IALA AIS Binary Message Register: Recommended Process”, International Association of Aids to Navigation and Lighthouse Authorities (IALA-AISM). Cape Town, Western Cape, South Africa, pp. 108-115, 2010. S. Clarke, Boyd, R., Hubble, T., Airey, D., Keene, J., Exon, N., and Gardner, J. V., “Sediment Characteristics of Submarine Landslides on the Upper East Australian Continental Margin--Preliminary findings”, American Geophysical Union (AGU). San Francisco, CA, USA, pp. 1-1, 2010. S. Intelmann, Smith, K., McConnaughey, R., and Rzhanov, Y., “Adding Ecological Context to Essestial Fish Habitat Models using Groundtruthing Technologies”, National Oceanic and Atmospheric Adminiatration (NOAA), Tech Memo, NMFS-F/SPO-112, 2010. K. Marks, Smith, W. H., Weatherall, P., Eakins, B., Elmore, P., Masry, M., Amante, C., and Abramova, A., “GEBCO Cookbook, Errors and Uncertainty in the Gridded Bathymetry”, GEBCO. Durham, NH, USA, 2010. T. C. Lippmann and Wiafe, G., “Africa Partnership Station: Developing Coastal Processes Research in Ghana”, Office of Naval Reasearch (ONR) , 2010. L. Alexander and Ward, R., “Production and Use of Nautical Charts”, T-Kartor and ERDAS Nordic User Conference. Ahus, Skane, Sweden, 2010. C. E. Parrish and Jeong, I., “Full-Waveform Lidar: Applications and Post-Processing Strategies”, American Society for Photogrammetry and Remote Sensing (ASPRS). Fairfax, VA, USA, 2010. S. Pe'eri, Gardner, J. V., Armstrong, A. A., Yoos, C. J., Holmberg, P. S., and Greenaway, M., “Hydrographic Survey Bottom Sampling Specifications: A Remote Sensing Perspective”, Canadian Hydrographic Conference (CHC). Quebec City, Quebec, Canada, 2010. L. Alexander, “ECDIS and Its Role in e-Navigation: The Promise and Reality”, eNavigation Conference. Seattle, WA, USA, 2010. A. Abramova, “Comparison and Evaluation of Publicly Available Global Bathymetric Grids”, GEBCO. Lima, Peru, Peru, 2010. L. Alexander, “Results from Canadian User Needs Survey”, Canadian Coast Guard and Ministry of Transport, 2010. L. Alexander and Schwehr, K., “New Standards for Providing Meteorological and Hydrographic Information via AIS Application-specific Messages”, International Hydrographic Review. Geomatics Information & Trading Center - GITC, Lemmers, Amsterdam, The Netherlands, pp. 37-44, 2010. T. Hubble, Yu, P., Airey, D., Clarke, S., Boyd, R., Keene, J., Exon, N., and Gardner, J. V., “Physical Properties and Age of Mid-slope Sediments Dredged from the Eastern Australian Continental Margin--Implication for Continental Margin Erosional Processes”, American Geophysical Union (AGU). San Francisco, CA, USA, pp. 1-1, 2010.